Surgical removal of lower third molar is a common procedure in clinical dental practice ,,, and could be associated with post-operative complications related to inferior alveolar nerve injuries. Permanent nerve injury amounts between 0.2% and 1% of surgeries, while the temporary injury is between 3.3% and 13%, ,,,, and increases around 30% when third molar root is in direct contact with the inferior dental nerve. Consequently, a specific evaluation of the mandibular canal and the proximate molars is essential during pre-operatory planning. Lateral oblique radiography (LOR) is an extra-oral technique referred to as lateral oblique mandibular view. In some situations LOR is the favored technique in view of the low cost and the low patient radiation dose; this radiography technique could be use by the vertical tube shift method. In view of the necessity to establish the dental position and its relation with mandibular canal, some authors, based on the ALARA principle, recommended the use of radiographic localization methods. ,, Thus, this study aimed to evaluate a LOR, based on the vertical tube displacement technique (VTDT) using two different incidence angles to determine the position of the mandibular canal and lower third molar and moreover, to evaluate the linear measures distortions, using CT images as the gold standard. This cross-sectional study was conducted with a total of 24 jaws and 37 third molars selected from the Anatomy Museum of UdelaR School of Dentistry. This research was approved by the Ethics Committee of UdelaR's School of Dentistry. 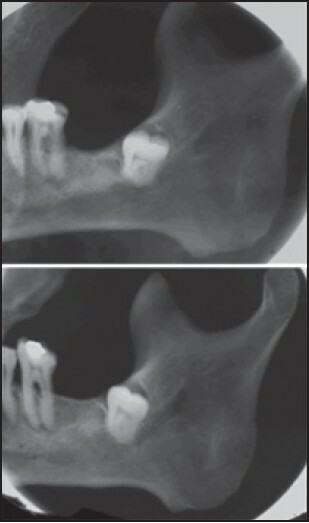 Two lateral oblique radiographs were obtained of each third molar with a distinct vertical angle (0° and -30°, respectively) [Figure 1]. The X-rays beam was directed to the retro mandibular space  located at the intersection of the posterior margin of the mandibular ramus and a horizontal line extended posteriorly from the basal mandibular bone. The jaws were placed in a standard device and the image receptor in parallel position and direct contact with the ramus and mandibular body under study. LORs were acquired on a Kodak 2200 intra-oral system (exposure values of 70 Kv, 7 mA and 0.01 s). An 18 × 24 cm Kodak radiographic film was used. The exposed film was manually processed. Axial tomograms (SOMATOM Siemens AG Medical Solutions, Erlangen, Germany, 64-channel, 120 Kv and 90 mA) were obtained of each of the jaws in a standard position, with a slide distance of 0.5 mm. These images accounted the gold standard. The examiner had a calibration run up. A trained and calibrated examiner (Kappa > 0.8) made the measures, two times with an interval of 15 days. The 0° LOR was firstly evaluated followed by -30°, measuring the distance from the most apical point of the third molar to the most superior point of the mandibular canal. The evaluations were made on a light box using a digital calliper. Based on the radiographic localization method, the relationship between the mandibular canal and the third lower molar was classified as lingual, central or buccal position, established by the value found: Decrease, unchanged or increase. The minimum unit considered was 0.2 mm, based on the resolution capacity of the human eye. The analyses were repeated with a 15-day time interval. To establish the linear measures distortion, marks were made on the radiographs and tomograms, showing the crown equator and the crown-radicular length of third molars (tooth length). The distance between the distal alveolar crest of the third molar, determined vertically until the mandibular basis and horizontally until to the posterior margin of the mandibular ramus [Figure 2]. If the distal crest of the third molar could not be considered due to intra-osseous insertion, the distal alveolar crest of the lower second molar was used. Four linear measures were made on all radiographs with a digital calliper on a light box, totaling 12 measurements. The gold standard was defined by the tomograms using Osirix software tools. R Software (version 2.15.3) was used to run statistical analysis. Sensitivity, specificity, positive predictive values, negative predictive values and accuracy values were calculated based on gold standard. The intra-observer reliability was assessed by kappa values. Radiographic distortion was evaluated using the paired t-Student test, with P ≥ 0.05; P < 0.05( * ); and P < 0.01( ** ). Two of the 37 third molars were not evaluated because the incapability to observe the mandibular canal. The distribution of the mandibular canal location, determined by the tomographic images (gold standard) was: Central = 9 (25.7%), lingual = 3 (8.6 %) and buccal = 23 (65.7 %). [Table 1] and [Table 2] show sensitivity and specificity, positive and negative predictive values and accuracy for the two LOR evaluations. Accuracy of intra-observer agreement was between 0.943 and 0.971. A high degree of intra-observer agreement was found between the first and second evaluations, with kappa = 0.832. Sensitivity and specificity, as well as positive and negative predictive values of intra-observer agreement are displayed in [Table 3]. As in [Table 4], a comparison of the -30° and 0° LOR shows a higher distortion in vertical measurements. Considering that measurements of tooth length and body are vertical and that those of crown and ramus are horizontal, a higher degree of distortion by magnification was observed in vertical measurements, as shown in [Table 5]. Third molar extraction is the surgical procedure most frequently conducted by dentists and dental surgeons. An imaging exam is indicated prior to surgery to assess the relation of the LTM with the MC, aiming to avoid any damage to the inferior alveolar nerve. ,,, Panoramic radiography is the chosen exam, ,,,,, followed by intra-oral periapical radiography. , Although those exams allow an evaluation of tooth position and an estimation of its proximity to the MC, a bucco-lingual appreciation of the MC and the identification of direct contact between structures are not possible. In this situation, some authors ,, recommended the use of CBCT for a deep assessment of the relation between ITM and the MC. In spite of the reduced radiation dose when compared to the fan beam CT, , its radiation is higher than a radiographic exam. Besides, the availability of CBCT units is still limited in some places. Therefore, this study aimed to test a low radiation exam available for a population that do not have access to panoramic or CBCT units. Also, a variation in the LOR technique allowed an evaluation of the bucco-lingual position of the MC. No previous studies have reported on the use of the parallax principle on the vertical plane for establishing the bucco-lingual relationship of the MC with respect to the LTM. The results from this study demonstrated that the LOR-proposed technique is highly effective to classify the MC as lingual, central or buccal in relation to the LTM. Ghaeminia et al. observed that lingual positioning of the MC is significantly linked with injuries to the IAN, showing the importance of this assessment before surgery. Kositbowornchai et al. suggested the use of CBCT if a panoramic radiograph combined with periapical technique with vertical tube shift method does not provide sufficient information, or when it is not possible to conduct an intra-oral exam. According to the results from this study, the LOR does not cause patient discomfort, and may be considered prior to the CBCT indication. One disadvantage of the use of LOR, compared with CBCT, is associated with image distortion or magnification, since CBCT provides non-superimposed real-size images on the three spatial planes. ,,,, However, compared with panoramic radiography - reported magnification values between 20% and 30% for the posterior mandible region ,,, - the distortion values found in this study - in order of 15% and 26.5% when angulations of 0° and -30° were used, respectively - suggest that LOR can be used successfully, with LOR at 0° resulting in a smaller degree of distortion than panoramic radiography. Kositbowornchai et al. compared the ability of two radiographic methods: The panoramic radiograph in combination with a 20-degree negative angle periapical radiograph versus two periapical radiographs 0° and -20°, in evaluating the closeness of the lower third molar root and the mandibular canal. The present study obtained specificity and sensibility values much higher than Kositbowornchai et al. study. Because the distance between the MC and the ITM is small, and occasionally both are superimposed, it is necessary to change the vertical angle to a minimum of -30° in the second acquisition in order to observe the apparent movement of the MC in the radiographic image. However, LOR at −30° resulted in appreciable distortion, amounting to up to 26.5% of the tooth length. Thus, those images should be interpreted with extreme care based on understanding of the particular image acquisition principles. Neugebauer et al. compared the diagnostic value of conventional radiologic procedures using a panoramic radiograph and symmetrical PA cephalometric radiograph convened with that of a CBCT device for identifying the position of the root tip in relation to the alveolar nerve. The difference between the diagnostic information for the horizontal dimension was highly significant (P = .000), with an advantage for the CBCT. In our study, the diagnostic information for the horizontal dimension showed no significant difference between convened LOR and CT, with a highly significant accuracy (P = 0.0000752). On the other hand, 9.0% of the MC could not exactly be determined in the conventional radiographic group and 2.8% could not be determined exactly at CBCT in the Neugebauer et al. study. In the study by conducted by Suomalainen et al.,  in cross-sectional tomography, the MC was graded as invisible or the evaluation unreliable in 41% (reader 1) and 28% (reader 2) of the cases. In the present study, in 5, 4% of the cases the MC could not be exactly identified showing that LOR is an imaging method that provides precise location of the MC. The results of this study allowed the assessment of the ITM with a low cost, good image quality and, more important, low radiation dose technique. Therefore, LOR at incidence angles of 0° and -30° may be successfully used to determine the bucco-lingual relationship between the mandibular canal and the lower third molar. The authors thank the authorities of UdelaR and UFRGS for an agreement signed between both institutions that made this study possible. 1. Neugebauer J, Shirani R, Mischkowski RA, Ritter L, Scheer M, Keeve E, et al. Comparison of cone-beam volumetric imaging and combined plain radiographs for localization of the mandibular canal before removal of impacted lower third molars. Oral Surg Oral Med Oral Pathol Oral Radiol Endod 2008;105:633-43. 2. Suomalainen A, Ventä I, Mattila M, Turtola L, Vehmas T, Peltola JS. Reliability of CBCT and other radiographic methods in preoperative evaluation of lower third molars. Oral Surg Oral Med Oral Pathol Oral Radiol Endod 2010;109:276-84. 3. Sedaghatfar M, August MA, Dodson TB. Panoramic radiographic findings as predictors of inferior alveolar nerve exposure following third molar extraction. J Oral Maxillofac Surg 2005;63:3-7. 4. Gbotolorun OM, Arotiba GT, Ladeinde AL. Assessment of factors associated with surgical difficulty in impacted mandibular third molar extraction. J Oral Maxillofac Surg 2007;65:1977-83. 5. Friedland B, Donoff B, Dodson TB. The use of 3-dimensional reconstructions to evaluate the anatomic relationship of the mandibular canal and impacted mandibular third molars. J Oral Maxillofac Surg 2008;66:1678-85. 6. Kovisto T, Ahmad M, Bowles WR. Proximity of the mandibular canal to the tooth apex. J Endod 2011;37:311-5. 7. Nakagawa Y, Ishii H, Nomura Y, Watanabe NY, Hoshiba D, Kobayashi K, et al. Third molar position: Reliability of panoramic radiography. J Oral Maxillofac Surg 2007;65:1303-8. 8. Bundy MJ, Cavola CF, Dodson TB. Panoramic radiographic findings as predictors of mandibular nerve exposure following third molar extraction: Digital versus conventional radiographic techniques. Oral Surg Oral Med Oral Pathol Oral Radiol Endod 2009;107:e36-40. 9. Kositbowornchai S, Densiri-aksorn W, Piumthanaroj P. Ability of two radiographic methods to identify the closeness between the mandibular third molar root and the inferior alveolar canal: A pilot study. Dentomaxillofac Radiol 2010;39:79-84. 10. Susarla SM, Dodson TB. Preoperative computed tomography imaging in the management of impacted mandibular third molars. J Oral Maxillofac Surg 2007;65:83-8. 11. Whaites E. Essentials of Dental Radiography and Radiology. London: Elsevier Limited; 2007. p. 141-7. 12. Tantanapornkul W, Okouchi K, Fujiwara Y, Yamashiro M, Maruoka Y, Ohbayashi N, et al. A comparative study of cone-beam computed tomography and conventional panoramic radiography in assessing the topographic relationship between the mandibular canal and impacted third molars. Oral Surg Oral Med Oral Pathol Oral Radiol Endod 2007;103:253-9. 13. Nakamori K, Fujiwara K, Miyazaki A, Tomihara K, Tsuji M, Nakai M, et al. Clinical assessment of the relationship between the third molar and the inferior alveolar canal using panoramic images and computed tomography. J Oral Maxillofac Surg 2008;66:2308-13. 14. Jhamb A, Dolas RS, Pandilwar PK, Mohanty S. Comparative efficacy of spiral computed tomography and orthopantomography in preoperative detection of relation of inferior alveolar neurovascular bundle to the impacted mandibular third molar. J Oral Maxillofac Surg 2009;67:58-66. 15. Benediktsdottir IS, Hintze H, Petersen JK, Wenzel A. Accuracy of digital and film panoramic radiographs for assessment of position and morphology of mandibular third molars and prevalence of dental anomalies and pathologies. Dentomaxillofac Radiol 2003;32:109-15. 16. Ludlow JB, Nesbit SP. Teaching radiographic localization in dental schools in the United States and Canada. Oral Surg Oral Med Oral Pathol Oral Radiol Endod 1995;79:393-7. 17. Jacobs SG. Radiographic localization of unerupted maxillary anterior teeth using the vertical tube shift technique: The history and application of the method with some case reports. Am J Orthod Dentofacial Orthop 1999;116:415-23. 18. Jacobs SG. Radiographic localization of unerupted teeth: Further findings about the vertical tube shift method and other localization techniques. Am J Orthod Dentofacial Orthop 2000;118:439-47. 19. Freitas A, Rosa E, Faria J. Radiologia Odontológica. 1 st ed. São Paulo: Artes Médicas; 2002. p. 162-3. 20. Gomez M. Radiología Odontológica. Buenos Aires: Editora Mundi; 1975. p. 120-2. 21. 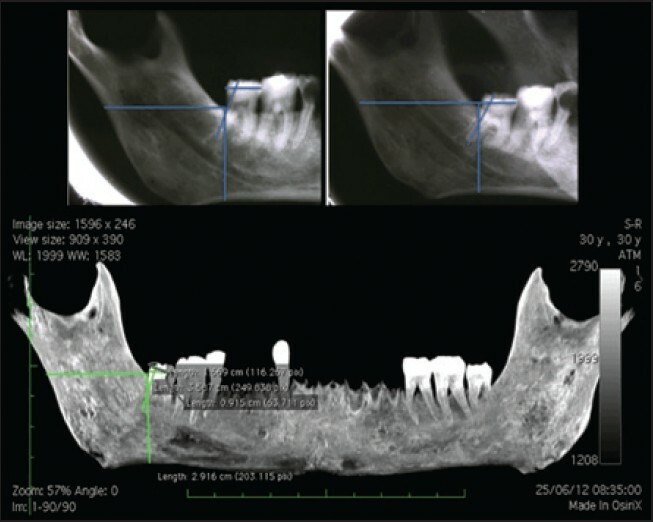 Koong B, Pharoah MJ, Bulsara M, Tennant M. Methods of determining the relationship of the mandibular canal and third molars: A survey of Australian oral and maxillofacial surgeons. Aus Dent J 2006;51:64-8. 22. Sivolella S, Boccuzzo G, Gasparini E, De Conti G, Berengo M. Assessing the need for computed tomography for lower-third-molar extraction: A survey among 322 dentists. Radiol Med 2012;117:112-24. 23. Delamare EL, Liedke GS, Vizzotto MB, da Silveira HL, de Azambuja TW, da Silveira HE. Topographic relationship of impacted third molars and mandibular canal: Correlation of panoramic radiograph signs and CBCT images. Braz J Oral Sci 2012;11:411-5. 24. Geneser F. Histología Sobre Bases Biomoleculares. 3 rd ed. Buenos Aires: Médica Panamericana; 2008. p. 21. 25. Mengel R, Kruse B, Flores-de-Jacoby L. Digital volume tomography in the diagnosis of peri-implant defects: An in vitro study on native pig mandibles. J Periodontol 2006;77:1234-41. 26. Mengel R, Candir M, Shiratori K, Flores-de-Jacoby L. Digital volume tomography in the diagnosis of periodontal defects: An in vitro study on native pig and human mandibles. J Periodontol 2005;76: 665-73. 27. Ruiz C, Jimenez L, Guzman C. Assessment of Vertical Mandibular Panoramic radiographs distortion. Revista Dental de Chile 2005; 96:17-20. 28. Vázquez G, Araujo A, Martinez B. Comparison between periapical and panoramic radiographic techniques in premolares. Revista Mexicana de Odontología Clínica 2007;1:10-6.
of panoramic and periapical radiographs in erupted third molar inclination. Iran J Radiol 2011;8:15-21. 30. White SC, Pharoah MJ. Radiología Oral: Fundamentos e Interpretação. 5 th ed. Rio de Janeiro: Elsevier; 2007. p. 88-256. 31. Ladeira DB, Cruz AD, Almeida SM, Bóscolo FN. Evaluation of the panoramic image formation in different anatomic positions. Braz Dent J 2010;21:458-62. 32. Hoseini Zarch SH, Bagherpour A, Javadian Langaroodi A, Ahmadian Yazdi A, Safaei A. Evaluation of the accuracy of panoramic radiography in linear measurements of the jaws. Iran J Radiol 2011;8:97-102. 33. Dudhia R, Monsour PA, Savage NW, Wilson RJ. Accuracy of angular measurements and assessment of distortion in the mandibular third molar region on panoramic radiographs. Oral Surg Oral Med Oral Pathol Oral Radiol Endod 2011;111:508-16. 34. Ghaeminia H, Meijer GJ, Soehardi A, Borstlap WA, Mulder J, Bergé SJ. Position of the impacted third molar in relation to the mandibular canal. Diagnostic accuracy of cone beam computed tomography compared with panoramic radiography. Int J Oral Maxillofac Surg 2009;38:964-71. 35. Ludlow JB, Davies-Ludlow LE, Brooks SL. Dosimetry of two extraoral direct digital imaging devices: NewTom cone beam CT and Orthophos Plus DS panoramic unit. Dentomaxillofac Radiol 2003;32:229-34. 36. Mah JK, Danforth RA, Bumann A, Hatcher D. Radiation absorbed in maxillofacial imaging with a new dental computed tomography device. Oral Surg Oral Med Oral Pathol Oral Radiol Endod 2003; 96:508-13. 37. Schulze D, Heiland M, Thurmann H, Adam G. Radiation exposure during midfacial imaging using 4- and 16-slice computed tomography, cone beam computed tomography systems and conventional radiography. Dentomaxillofac Radiol 2004;33:83-6. 38. Ludlow JB, Davies-Ludlow LE, Brooks SL, Howerton WB. Dosimetry of 3 CBCT devices for oral and maxillofacial radiology: CB Mercuray, NewTom 3G and i-CAT. Dentomaxillofac Radiol 2006;35: 219-26.